Production information, copies of Ford invoices and information directly from Ford are now available for 1982-1993 Mustang GT's. This is extremely valuable information for documentation on what options your GT was originally equipped with and how many were made like yours. "Marti Reports" are available for sale from Marti Auto Works. Marti Auto Works has obtained Ford's licensed production database and sells reports containing original production information for your car and personalized statistics of how many cars were produced like yours. 3 different levels of reports are available - Standard, Deluxe and Elite... we highly recommend getting the Deluxe or Elite reports for the production information they contain. "Eminger Invoices" are available for sale from Marti Auto Works (only available for Mustangs up to 1986 at the current time) . 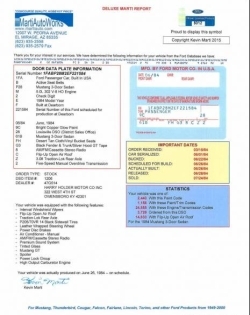 Per the Marti Auto Works web site, "These are the original documents that were used by Ford for billing to the dealer. They contain the complete option list and, generally, the wholesale and retail costs of the base vehicle, all options, and shipping. 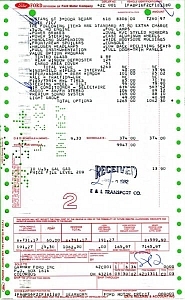 The original dealer the vehicle was shipped to is also included on the invoice along with the trim code, date the invoice was prepared, and several other items." Ford's FREE "Vehicle History" reports (also known by Ford as "999" reports, "history 999" reports or "build" reports) are available by calling Ford Customer Assistance at 1-800-392-3673 (USA) or 1-800-565-3673 (Canada). To get this report you will have to work your way through the phone tree choosing the "other information/other inquiries" options until you get to a live person then you will give them your car's VIN and your name, address, etc. These reports are also available by using Ford's customer assistance email form (type in your request in the inquiry box including the VIN - don't use the VIN box as it won't take your VIN). One word of WARNING - Ford's reports are well known for frequently containing inaccuracies and errors. NOTE!!!! If you order any of these reports, we would appreciate if you would provide us a copy!! We encourage you to upload anything you can share to the appropriate Reference Gallery sections. OR you can upload them when you submit your GT Registration form. We definitely prefer that you submit your documentation and information via our online Reference Gallery or registration forms, however, if necessary you may email them to us at mustanggt@mustanggt.org or mail them to the address listed at the bottom of the page.